As the net worth of the five richest American company founders has more than doubled over five years, the personal security costs to their companies have not grown at the same rate—with the exception of Mark Zuckerberg. Spending on Zuckerberg’s personal security increased more than 500% from 2012 to 2017—a sum that doesn’t take into account the $10 million allocated to Zuckerberg in July or the measures the company has taken to harden its defenses at its Menlo Park, California, campus. That compares with a 220% increase in his net worth over that same period, to $56 billion in 2017. Some of the security measures adopted appear ripped from the pages of a Tom Clancy thriller, including a rumored “panic chute” for making quick escapes. American billionaires, and their lavish lifestyles, have come in for heightened criticism as income inequality in the U.S. reaches levels not seen since the years before the Great Depression. That raises questions about seemingly exorbitant corporate perquisites reserved for the wealthiest executives—like companies picking up the tab for personal security. Forbes looked at the five richest founders of public companies in the U.S. and found no correlation between growth in wealth and increased benefit for personal security paid by the firms they founded. Rather, companies like Facebook are making assessments about risk based on an executive’s visibility and a company’s connection to controversy. Zuckerberg has emerged as the public face of a social network that is associated with some of society’s most divisive issues and has unprecedented influence over billions of people’s lives. Amazon did increase spending on security for the world’s richest man, Jeff Bezos, as its founder’s visibility grew in Hollywood and in Washington, D.C., where the executive’s ownership of the Washington Post made him an occasional target of President Trump. But unlike with Zuckerberg, the security increase was barely a shadow of his rise in net worth. Bezos’s wealth soared to $131 billion this year, a staggering leap from $18.4 billion on Forbes’ 2012 list of the World’s Billionaires. Amazon spends $1.6 million a year on Bezos’ security, a figure that hasn’t changed since since 2012. In addition, the company picks up the tab for providing security at business facilities, according to regulatory filings. A company spokesperson said Bezos pays for personal security separately. Berkshire Hathaway didn’t report security costs associated with protecting its avuncular CEO, Warren Buffett, until 2008, a year after a man with camouflage paint on his face and a fake gun tried to break into the billionaire’s home. In 2017, Berkshire spent $375,000 on personal and home security services for the Oracle of Omaha, a 16% increase from security spending five years prior. Over that same time Buffett’s net worth rose 72% to $75.6 billion. Today, his net worth stands at $82.5 billion. Time and time again, Insite Risk Management president Christopher Falkenberg says, he’s been-hard pressed to find a correlation between a client’s net worth, his or her perceived risk and the amount of security he or she is willing to accept. In many cases, the level of security depends on what information is available about the executive in the public domain. For Larry Ellison, the founder of software firm Oracle, security spending actually declined over the last decade, even as his net worth rose 74% over the past seven years, to a current $62.5 billion. The company pays the annual costs of maintaining security personnel at his “primary residence”—likely Ellison’s Japanese-style Woodside, California, estate with its koi pond and tea house, though the company wouldn’t say—an amount that totaled $1.5 million in 2017 vs. $1.7 million in 2007. Ellison paid for the initial purchase and installation of the security equipment and is responsible for ongoing maintenance and upgrades, according to SEC filings. Ellison served as Oracle’s CEO until 2014, and is currently chief technology officer and chairman of Oracle’s board. Google parent Alphabet has not disclosed any spending in recent years to cover the personal security of its billionaire cofounder Larry Page, who is the parent company’s CEO. Nor has it disclosed any spending to protect Google cofounder and Alphabet president Sergey Brin. The last time Google devoted money to Page’s security was in 2006, when the company allocated $33,195 for transportation, logistics and personal security during personal travel for Page. Both Page and Brin, worth $50.8 billion and $49.8 billion on Forbes’ recently released Billionaires list, have elected to receive $1 annual salaries. The search giant did not respond to Forbes’ request for comment. However, the company does provide security for former Alphabet CEO Eric Schmidt and Google CEO Sundar Pichai. According to the most recent SEC filings, Schmidt was granted $296,353 for personal security in 2017, while Pichai was given $637,538 for personal security. Security analysts interviewed by Forbes say the amount a company spends to safeguard its top executives often depends on whether an executive or company is mired in controversy—or how recognizable an executive is. “If you are talking more about a high-profile CEO that is discreet and is not very outspoken, then this individual may opt out of having security,” said Andres Paz Larach, a senior vice president at longtime private security agency Pinkerton. Those who specialize in protecting celebrities and high net worth individuals say Zuckerberg’s visibility—and his association with Facebook’s numerous privacy breaches and Russian manipulation of the social network during the 2016 presidential election—heighten the risks. Business Insider recently reported that Facebook has dramatically expanded its security apparatus, as the social network girds against a range of perceived threats from car bombs to state-sponsored espionage to stolen prototypes. It reported that a 6,000-strong security army quietly protect its tens of thousands of employees and armed executive protection officers stand guard outside Zuckerberg’s homes. LOS ANGELES, CA, UNITED STATES, January 18, 2019 — Kent Moyer, CEO and President of the World Protection Group, is head of the International Executive Protection & Consulting firm that supports law enforcement agencies in many service areas. 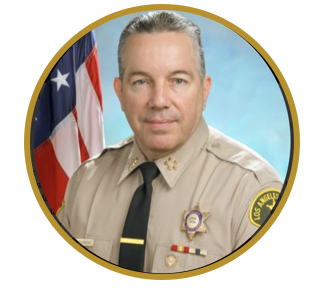 Now, the World Protection Group is having its 6th Annual Security Briefing Luncheon on January 23, 2019, and newly elected L.A. County Sheriff Alex Villanueva has been announced as a keynote speaker at the event. L.A. County Sheriff Alex Villanueva’s birthplace of Chicago, Illinois has taken him to both Rochester and Queens, New York, then to Aguadilla, Puerto Rico, before an enlistment in the United States Air Force brought him to Southern California in 1983. He joined the Sheriff’s Department in 1986, and eventually met the love of his life, Vivian, while working at ELA Station in 1993. He is the proud father of a son, a US Army Iraq War veteran, and has been blessed with two grandchildren. Sheriff Villanueva is a firm believer in education and is a great example of perseverance. He began his college education in Puerto Rico and continued while on active duty in the Air Force, eventually earning an Associate of Arts, Bachelor of Science, and Master of Public Administration Degrees, and ultimately, a Doctorate of Public Administration from the University of La Verne in 2005. PROMINENT SILICON VALLEY companies spend liberally to protect their intellectual property. Some also shell out considerable amounts to protect their executives. Apple’s most recent proxy statement, filed earlier this month, shows the company spent $310,000 on personal security for CEO Tim Cook. But that’s a fraction of other tech giants’ expenditures. Amazon and Oracle spent about $1.6 million each in their most recent fiscal years to protect Jeff Bezos and Larry Ellison, respectively, according to documents filed with the US Securities and Exchange Commission. And Google’s parent company, Alphabet, laid out more than $600,000 protecting CEO Sundar Pichai and almost $300,000 on security for former executive chair Eric Schmidt. In 2017, Intel spent $1.2 million to protect former CEO Brian Krzanich. Apple, Google, Intel, and Oracle declined to comment; Amazon did not respond to a request for comment. 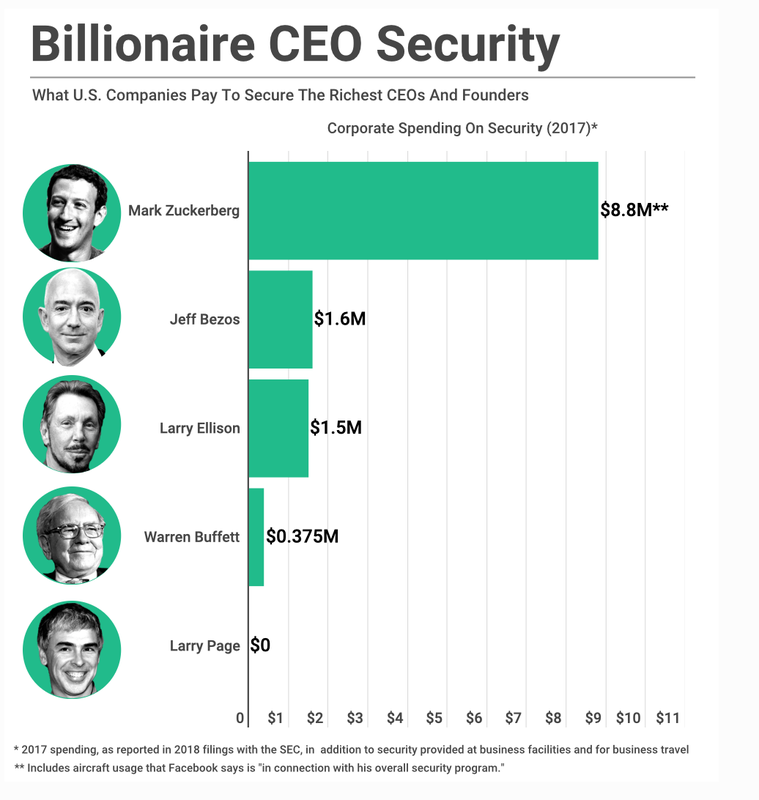 Facebook CEO Mark Zuckerberg was the costliest executive to protect; Facebook spent $7.3 million on his security in 2017, and last summer the company told investors that it anticipated spending $10 million annually. In 2013 Zuckerberg’s security detail cost $2.6 million. That’s about the same amount Facebook spent last year to protect chief operating officer Sheryl Sandberg. Security experts speculate that the planned increase in spending for Zuckerberg’s security in 2018 is likely due to his higher profile following last year’s Cambridge Analytica scandal, Congressional testimony, and data breaches. Heintze worked for the US Secret Service for two decades before going into the private sector; security workers at tech companies often come from similar backgrounds. One staffer in Facebook’s executive protection department spent 12 years with the Secret Service, according to LinkedIn, while another spent several years in Europe protecting NATO’s secretary general. A Google manager working in executive protection spent eight years working as a special agent in the Department of Defense, according to his LinkedIn profile. Kent Moyer runs the World Protection Group and 001, a pair of security firms in Beverly Hills, California, that count billionaires and executives among their clients. His protection arsenal includes bodyguards, security systems, drones for patrolling clients’ homes, armored motorcades, and extensive electronic privacy measures. Moyer advises clients and their families not to use their real names on social media, to purchase homes and other large assets in the name of LLCs (a common practice in Silicon Valley), texting only via encrypted apps, registering social media accounts to throwaway email addresses and phone numbers, and using credit cards registered to assumed names. “There are times where clients send me a text, and I say, I don’t want to text you using regular texting,” says Moyer. “We don’t believe in our clients using regular phones,” says Moyer. “We set up anonymous phones; mine are in Faraday bags.” His firm also recommends using VPNs to obscure a device’s location and using search engines that don’t track users. While Silicon Valley firms haven’t disclosed many threats to the safety of their executives or offices, they have good reason to take precautions. In December, Facebook evacuated its headquarters after the company received a bomb threat. Last year an unhappy YouTube user entered the company’s San Bruno, California, headquarters and shot three employees before killing herself. And in 1992 the president of Adobe, Charles Geschke, was kidnapped at gunpoint and rescued by the FBI. The sun is out for today’s Golden Globes but so is the bomb squad and more security than ever before. In the wake of last month’s gunman attack at a Christmas market in Strasbourg, France and the New Year’s Eve knifing rampage that left three injured in Manchester, UK, Hollywood is on high alert as the 76th Hollywood Foreign Press Association shindig gets underway this evening at the Beverly Hilton. “The recent attacks in Europe only reinforce that nothing can be left to chance tactically and strategically,” a highly placed local law enforcement official informed Deadline. “Our plan is to have eyes everywhere and shut down any possible disturbance that could arise long before it gets anywhere near the venue or the event,” he added of the road closures, armed officers, sniffing dogs and other barriers on the red carpet and around the perimeter of the Beverly Hilton on Sunday. Nominees, attendees and media showing up this afternoon will have to go through a labyrinth of security checkpoints to get to the ballroom, as well as many of the parties later tonight. In addition, the Beverly Hills police, who are the lead department on Globes security, and supporting regional and federal law enforcement such as the L.A. County Sheriff’s department are out in force on the roads and with bomb squad trucks and other heavy reinforcements. Officially, as has become the norm in the increasing security conscious Tinseltown and events like the Globes, Emmys, Oscars and Grammys, the BHPD aren’t revealing any security details, except to say like over the past 40 years, they got this. In that vein, should the skies remain clear and winds low, don’t be surprised to see the BHPD and supporting local and federal agencies launching drones to protect high profile nominees and other attendees, a security measure that NYPD couldn’t execute due to the rains on New Year’s Day in Times Square. “Most stadiums are still not protected for surveillance purposes with drones, and they’re cheaper than helicopters,” says World Protection Group Inc. CEO Kent Moyer whose firm covers security detail at Globes parties and privately with celebrities. As such, it’s quite common following these shooter attacks for local law enforcement to increase the number of snipers around the Hilton in an effort to protect attendees from any armed copycats of the tragedy in France. Following the horror in Strasbourg in late December which took two lives and a dozen wounded, the BHPD and Los Angeles County Sheriff’s department will likely extend their road barrier. That type of distance “stops attacks and buys time so that law enforcement can deliver a response and minimize casualties,” adds Moyer. As in past years of late, the cops have shut down Westbound Santa Monica Boulevard from Wilshire Boulevard to Century Park East. The road will remain blocked until 4 AM Monday. Eastbound Santa Monica Boulevard will be closed until 4 AM tomorrow too. Officers are also shuttering westbound Wilshire at South Santa Monica Boulevard until the same time. Wilshire will also be completely closed to all other through traffic between the country club and South Santa Monica Boulevard. Other local streets will be closed to all but local residents until 1 AM Monday. Those roads include: Whittier Drive from Wilshire to Sunset Boulevard; Trenton Drive from Wilshire to Whittier Drive; Carmelita/Elvado/Lomitas Avenue at Walden Drive; and Greenway from Sunset to Whittier Drive. 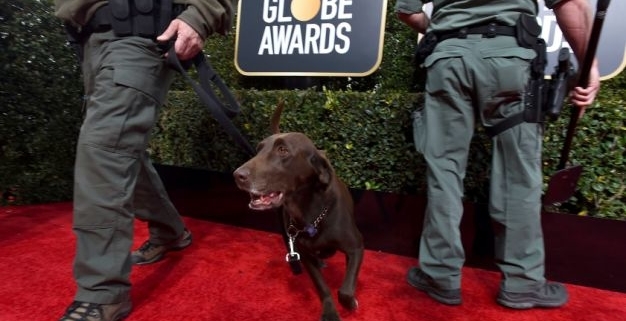 This year’s increased Golden Globes’ security builds on the heightened police presence of last year, which was the most intense for the ceremony up today. On the night of October 1, 2017, Stephen Paddock killed 58 people and injured hundreds in the deadliest mass shooting in US history. What was unique about the attack is that is was performed from above, in this case the 32nd floor of the Mandalay Bay Resort. Identifying the source of the gunfire was a challenge with reports of multiple attackers from multiple properties on the Las Vegas Strip. Eventually SWAT officers breached Paddock’s hotel room on the 32nd floor and found him dead with a self-inflictedgunshot. The first step in responding to a sniper attack is locating the source of the attack. This can be determined by calls from witnesses. The problem is with the chaos from the “fog of war” inaccurate details are reported. There are also witnesses that have difficulty stating their position clearly, further adding to the confusion. An unmanned aerial vehicle, also known as a drone, would have been beneficial in locating the attacker. Especially when this attack was performed from altitude. The drone would have helped increase situational awareness for the SWAT officers confronting Paddock. The drone would have been able to provide a live feed for the incident commander allowing for a more strategic tactical response. The goal is always to save lives and minimize any injuries. The DJI Spark Drone can be controlled by the palm of your hand, mobile device or remote controller. It can sense obstacles and can return home on your command without colliding into anything. It has facial recognition and can be launched from the palm of your hand and land back into your hand. As of May,2018 it is estimated that at least 910 state and local police, sheriff, fire, and emergency services agencies in the U.S. have acquired drones. By sending a drone into a high-risk situation first, it avoids putting first responders at risk and allows for a more efficient response. Drones can be equipped with imaging tools to assess the environment. Photogrammetry can measure the environment using overlapping imagery.Infrared thermography or thermal imaging detects radiation and variations intemperature. Drones have assisted emergency response personnel in locating missing persons, surveying burning buildings, surveillance, hazardous material calls and SWAT operations. They can capture footage to prepare for the response to the aftermath of natural disasters including floods, earthquakes, tornadoes and hurricanes. Drones can monitor conditions of spills, leaks and other hazmat incidents. The number one company of drones that have 70% of the drone market is DJI a company from Shenzhen, China. The capabilities and technology of these drones are rapidly improving. DJI drones range from $149 to $10,000. The DJI Spark Drone costs just $399 USD. Those are words we always want to hear from the World Protection Group (WPG) and 001 clients every day. To achieve this, we need to know what the WOW factor is, what it comprises and how to deliver it. Simple enough, a WOW factor means a quality and feature that is extremely impressive. In the Executive Protection field, it is critical to not only satisfy clients’ needs, but also make them feel impressed and leave a lasting footprint on them. Kent Moyer, the CEO of WPG always says, “Anticipate the needs of the client before they ask.” One of the elements of the WOW factor is to develop an excellent service culture. When you provide a Gold Standard personalized service for your client, he/she might not expect that but is bound to notice. You have to always keep your radar on and antenna up. Listen carefully and look for opportunity. The more you understand the clients’ personal life, such as their birthdays, hobbies, daily schedules and social life, the more personalized your service can be, such as writing a card for your client’s birthday, reminding your client his/her doctor’s appointment or dinner plans. This also leads to the ability to be able to evaluate any potential harmful and threatening situations, as well as anticipate their wants and needs. A high level of trust and an emotional connection can hence be formed. For instance, if the client is having dinner with friends in a crowded restaurant, it is crucial to be extra vigilant to the surroundings, assess potential threats, and predict client’s needs. When you aim beyond excellence, and turn ordinary to extraordinary, it makes a significant difference in Gold Standard customer service. The WOW factor is so important that it should be embedded into the DNA of each of our employees. In order to attain this, the corporate has to make the decision to adopt a Gold Standard culture in the company, which is the best model in delivering the WOW factor. Before establishing his own company, Mr. Kent Moyer took extensive classes at the Ritz-Carlton Leadership Center and received certifications for his trainings. He then utilized his knowledge and experience to train his WPG corporate team and Executive Protection Agents to have the WPG Gold Standard culture flowing in their blood. They are able to perform and deliver the WOW factor on a daily basis. Besides orientation and training, employee engagement is as significant. WPG selects employee of the month to recognize their outstanding performance and their service years. We also write our employees birthday cards for their birthdays to show our genuine care for them. Moreover, there is once-a-week engagement email as well as yearly weekend management retreat. When employees are being recognized, they are motivated to strive to achieve more, therefore delivering stronger WOW factor to our clients. Having happy and engaged employees is as important as having satisfied clients. We have to make sure that our Executive Protection Agents are proud of the company they work for and have commitment to excellence. They have to be passionate in delivering the WOW factor every single day because clients are our most valuable assets and we have to make them feel cared, respected and well-protected. Our goal is to develop a strong emotional connection of trust with every client and to deliver a daily WOW factor. How to create a Gold Standard Culture in an Executive Protection company? In the field of Security and Investigative services, executive protection work is in paramount importance to provide close protection and risk mitigation measures to ensure the safety of all clients. It is therefore critical to develop a Ritz-Carlton Gold Standard business culture that teaches Executive Protection Agents on how to deliver a gold standard service as well as protection in such high-level protective operations. Within a company, culture is like an iceberg. We can always only see the tip of the iceberg and not the bottom of it, but most of what constitutes a company’s culture is actually below the surface. As an advocate of the Gold Standard culture, the World Protection Group, Inc. pledge to proactively provide the finest personal services, security and safety in a low-profile way in order to ensure that our clients feel well-protected. Our goal is to always provide exceptional services, anticipate needs of the client, and go above and beyond to fulfill unexpressed wishes. It has to be embedded into the DNA of each of our employee. Employee commitment and engagement are key factors to shape a company’s culture. According to the CEO Kent Moyer of WPG, “We want to be perfect, but perfect isn’t good enough”. Striving for excellence is certainly better than just good. However, aiming beyond excellence is what a Gold Standard culture embraces. It is critical to develop a mystique that include both customers’ and employees’ engagement, with passion, pride, integrity, confidence, inspiration, motivation and satisfaction. The goal is to deliver a WOW factor that would leave a lasting footprint on our clients and develop an emotional connection with them. In order to create a Gold Standard culture in a company, it is crucial to establish a sense of connection with all our most valuable clients. Never say “that is not my job”, but always strive to achieve more. Delivering thoughtfulness and care develops a deep connection with clients as well as creates an environment of trust. Always keep your radar on and antenna up. Be proactive and get to learn more about the clients’ personal life, such as their birthdays, hobbies, daily schedules and social life. This could greatly facilitate the relationship between employees (Executive Protection Agents) and clients. With sufficient knowledge of the client’s background, it is then easier to evaluate any potential harmful & threat situations, as well as anticipate and fulfill their needs. “At 211 degrees, water is hot. At 212 degrees, it boils. And with boiling water, comes steam. And with steam, you can power a train.”* Thinking one degree more of that extra service makes a significant difference in customer service. Such great effort would make our clients feel being cared, respected and well-protected. Behind the company’s Gold Standard Culture, a well-rounded and productive team of employees is of the utmost importance. WPG selects the best talents by screening candidates’ social media accounts to make sure there are no problems. Criminal and civil background checks, reference checks, drug tests, and also psychological assessments are performed as standard hiring procedures. Successful candidates are then required to complete our Gold Standard Training so that they would be empowered to create unique, memorable and personal experiences for our clients. We offer that training for free 4 times a year to reinforce the importance of this standard. Providing genuine care and comfort for our clients is our highest mission. We not only ensure their safety, but also strive to build trust and connection with them. We fulfill even their unexpressed wishes and needs because we have to show our clients that no detail is too small to provide excellent service. For more information call our corporate office at 310-390-6646. Let’s face it, your phone is a tracking device. It is capable of broadcasting your location and communications to anyone. This is useful for navigating to work or for emergency services to determine your location. But as a celebrity or CEO of a Fortune 500 company, do you really want your identity attached to your location as well as a risk of being hacked? In a 6-month study conducted on Tracking Human Mobility using WiFi signals, it was discovered that a third party that has no access to location data but access to records of WiFi scans can effectively determine the location of each individual 90% of the time by sending less than 20 queries to Google Geolocation API or Skyhook for example. By using the physical position of multiple wireless access points and the time you connect to those points, one can determine your location. Your wireless carrier also logs details such as the phone numbers, duration and date and times for every text message and phone call you make. If you use any of the three major search engines, Google, Yahoo, or Bing, everything you search is being tracked. The search engines know more about you then you know about yourself. What happens when you do not protect your privacy? Between April 2013 and August 2014, Emilio Herrera hacked into 550 Apple iCloud and Gmail accounts which included 40 celebrity accounts. Herrera used a type of attack called phishing where he was able to obtain login information by sending an email that looked like it was from a legitimate company. The users that were targeted did not confirm the legitimacy of the emails before providing their login details, resulting in their accounts becoming compromised. Herrera was able to obtain sensitive photos, videos and other personal information. What can I do to protect my privacy? Set up an anonymous phone. To start off, buy the phone with cash, use an alias name and prepaid service, then you can remove the association between your phone and identity. Secondly, use encrypted emails, messages and phone calls. You do not to worry about your communications being logged or intercepted while in transit. In addition, you should never give out the number of the anonymous phone to anyone. Never make a phone call or receive a call from that phone. Communication is done only by encrypted apps. Whenever you are connected to a wireless network or are sending and receiving Bluetooth signals, your phone is susceptible to data theft. By placing your phone when turned off in a Faraday bag, these signals can be blocked. For example, one can determine the location of your residence through your phone. You should turn off your phone about a mile or two from your home and then place it in the Faraday bag. The World Protection Group, Inc. (WPG) has worked with some of the most high-profile individuals in the world. We have also worked with corporate CEOs, political dignitaries and famous celebrities. WPG sets up anonymous phones for clients. Please use our 28 tips for setting up an anonymous phone. 1. Go to an Apple store and pay cash for the phone and get a receipt. 2. Do not give your name, e-mail, or any other information. If you purchase the phone online use a one time fake credit card that you can set up with an alias name and e-mail that does not connect to you. 3. Go to cell phone service company, pay cash for prepaid service and have them install it. Do not give them any information on you. 4. Add a VPN to the phone. 5. WIFI- Make sure there is no list of the wifi’s you used on the phone. Delete them. If possible only connect to wifi with your home network. 6. Set-up 2 layers of unencrypted e-mails. One fake e-mail that forwards to a real e-mail. 7. Keep bluetooth off. If you have to use it, make sure you use password to connect then turn it back off. 8. Add an encrypted e-mail app on your phone. 9. Add an encrypted texting app on your phone. 10. Add an encrypted app to make phone calls from. 11. When you register apps do not use your real name, e-mail, or phone number. 12. Do not ever make a call from the cell phone or receive a call from this phone. Never give the number out to anyone. 13. Never use find my friends. Turn it off. 14. Do not download videos or watch videos, games, or files. 15. Don’t text or receive texts on the phone texting system. 17. Don’t use this phone for browsing on the internet. 18. Only use personal hotspots with a password. 19. Do not use airport wifi. 21. Touch ID and password: Use both touch ID and password to unlock your phone. This creates 2 layers of security. 22. Privacy settings – Do not use the camera for any apps access unless needed. You can change the setting each time. Turn location services on foras few things as possible. 23. Only use one page on your phone with apps. Do not keep adding apps. 24. Do not use I-cloud for anything. 25. Set-up 9 alias names, e-mails, and phone numbers from various cites that you do not live in. 26. Buy a faraday bag for your phone and put the phone in the bag when not in use. 27. Never use any of your real information on this phone. 28. Use a two factor authentication on all apps when possible. A high-profile individual typically hires a security detail in order to protect themselves against “External Threats.” Armed robberies, physical altercations, overly aggressive fans— these are all external threats that pose danger and harm to their physical health and safety. However, another security threat exists that is seemingly overlooked, yet just as important to insure against – “Internal Threats.” Internal Threats are the complex system of interpersonal relations, company culture, and personnel disciplinary history that have the potential to become a threat to the high-profile individual’s security. It’s the Trojan horse no one saw coming. Copyright © WPG001. All Rights Reserved.